3 Bedroom, 1 bathroom cottage in enclosed garden surrounded by fields. The Bailiff's House is a detached, single storey property which sleeps six people. 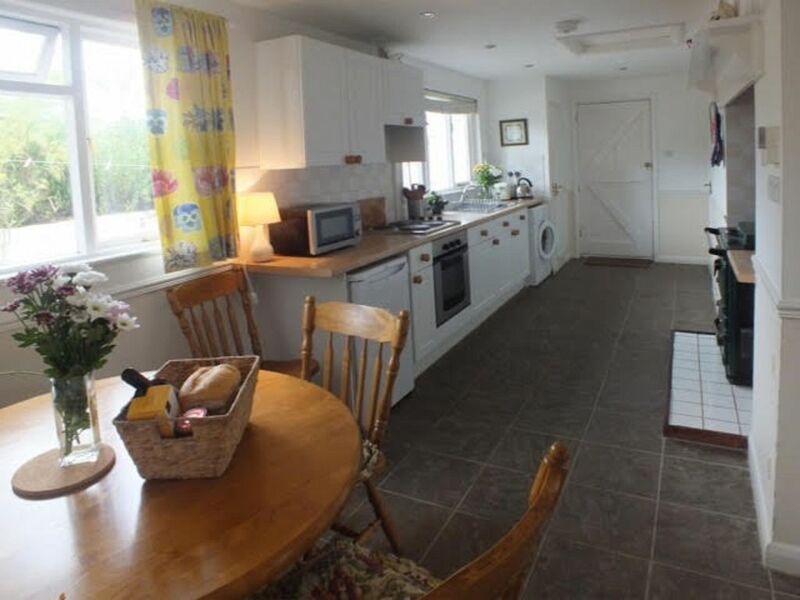 It has a Rayburn in the kitchen as well as a conventional cooker and a wood burning stove in the sitting room the fuel for which is provided free of charge. The house is set in its own enclosed, dog-proof garden in the middle of a livestock farm in North Cornwall. We positively welcome dogs and do not charge for their visit. There is a purpose built kennel and a dog shower for the sole use of Bailiff's guests dogs. Guests are also welcome to enjoy the lake and dog exercise area down by the farmhouse. In the morning guests can wake up to the sights, sounds and smells of the countryside and then spend the day swimming and surfing at the seaside - a short drive away. The Camel Trail is nearby as is the Camel Valley vineyard. John and Caroline Drake keep 200 cattle, several horses and 3 terriers at Sleeve Farm near Liskeard. Higher Tregawne is farmed by their tenant, Henry who keeps 400 cattle and 1,000 sheep! It is a busy and rewarding life for all of us although not financially! It is perfect for the whole family including the dogs. You can let them out of the door secure in the knowledge that they won't disappear and that goes for the children as well. You are also welcome to enjoy the lake area in front of the farm house where you could have a barbecue or a picnic and meet the other guests and their dogs. Tregawne sits at the head of the Ruthern Valley overlooking its own extensive grounds. It is extremely private. Our own experience of cottage holidays with dogs have told us that when the brochure says 'dog friendly' it means you can bring your dog and that's about it. There have been no facilities for dogs let alone a dog proof garden. We aim to take the stress out of taking your dog away so that everyone can relax and enjoy the break. Rayburn in the kitchen and storage heaters in the bedrooms and hallway. Bed linen and towels provided for guests staying a week or longer. Towels only for short breaks. Ample off street in front of the property. All wood provided free of charge. With TV. Wood burning stove in the fireplace. Welcome basket for guests staying a week or longer. All crockery, glassware and kitchen equipment supplied. Cards, board games, jigsaws in wall cupboard. Builders or other people looking for accommodation while working in the area must contact Caroline BEFORE booking. Working livestock farm with the opportunity to see calves and lambs from the windows of the cottage. Very pleasant stay. The cottage was comfortable and surroundings were just what we needed garden fenced in which was a godsend, allowed the dogs free run.Easy access to beaches and walks.Town about 4 miles away ,plenty of access to shopping. Perfect for kids and dogs alike! Very spacious home from home! The property was in a lovely location, we used it as our base around Cornwall the kids were very happy as they could be noisy and they loved the garden. The kitchen had every thing you would need to cook a family meal and the woodburner in the living room was lovely. We stayed over New Year. We visited various places in the time we were there. The bungalow was lovely and warm and provided everything we needed, including a Rayburn and a dog kennel. We would love to return to Bailiff's House in the future. Thank you for a great stay. Beautiful location. Nice and quiet. Nice little cottage. Clean and tidy. The welcome package was a great idea. Great Little Bungalow: Very clean : Fresh Smelling : Warm and Cosy. 2 of us and our well behaved Staffy stayed. Firstly, the property was very clean and fresh smelling. All linen and towels were in good condition and well aired. It’s a lovely warm little house that’s really dog friendly. It has large and very secure gardens. Being a working farm it’s lovely to wake up to the noise of cattle and the smell of the country and a tractor passing the gate several times each day. The property has a traditional Rayburn cooker, great for drying off clothes, keeping your take away warm or indeed cooking. We cooked a meal on it, what a great memory and experience. The owner left a welcome pack of milk, jam, shortbread and fresh flowers, how lovely. The property is pet friendly so please expect a traditional Cornish farm workers bungalow and not the Ritz Hotel. The position is the main reason we chose it was it’s in a Central location so head off north one day or to either coast another day, Perfect. It’s well equipped and quite roomy and will comfortably sleep six if you had a family. There’s a huge garden or an even larger secure dog excercise area with a small lake to explore too. The help/visitors book is gold, lots of useful info and a comical read, it should be published. The bungalow has an out building so if you had a few dogs they could live in it, massive and safe building. The outdoor dog shower is brilliant for showering of sandy dogs after a day out at the beach. This little place is a gem providing that your a family and pet loving people and not looking for a Handsel and Gretal cottage or a fairy tale. We are already discussing a return in 2019. Great owners, no hassle and respect your privacy. Great value for money. There are a number of beaches open to dogs all year round. For food and wine lovers a tour of the Camel Valley winery is a must as are the gourmet restaurants of Stein and Outlaw in Padstow. The Eden Project is only 25 minutes away.